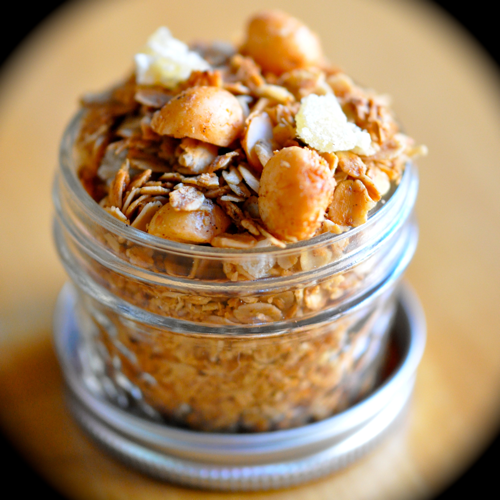 Granola is a wonderful snack and easily adaptable to whatever maybe in your pantry. It's fabulous with milk or yogurt. This granola would taste delightful with some fresh pineapple or mangoes. It will bring your senses to the tropics. Right now in Ohio, we are not yet experiencing spring weather, but this granola will make your day much brighter and warmer. 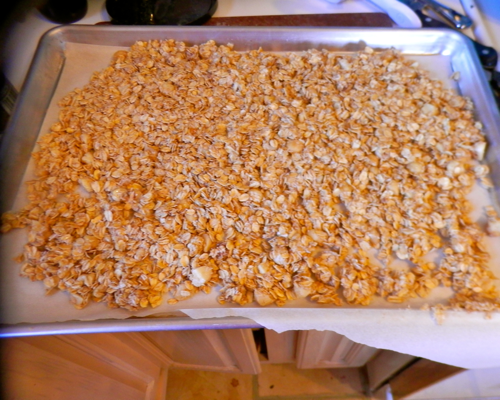 Don't forget to make this granola your own. Use whatever nuts or dried fruit you have around the house. You may also switch out the sweetener for brown sugar, sugar or agave nectar if you like. 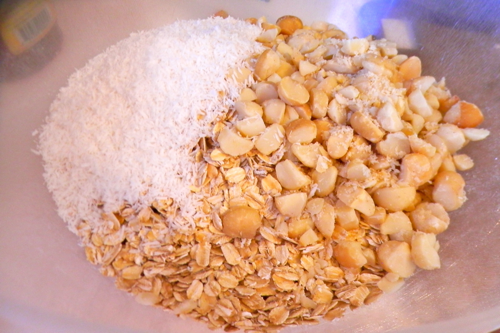 For a richer, granola you may use butter in place of coconut oil. For a nutrient kick, add flaxseeds, chia seeds or even some dried milk for a protein boost. Combine all ingredients except crystallized ginger. Bake at 325 degree F for 40 minutes or until golden brown and dried out. Stirring every 15-20 minutes. Remove from oven and let cool. Then add crystallized ginger and stir to combine.